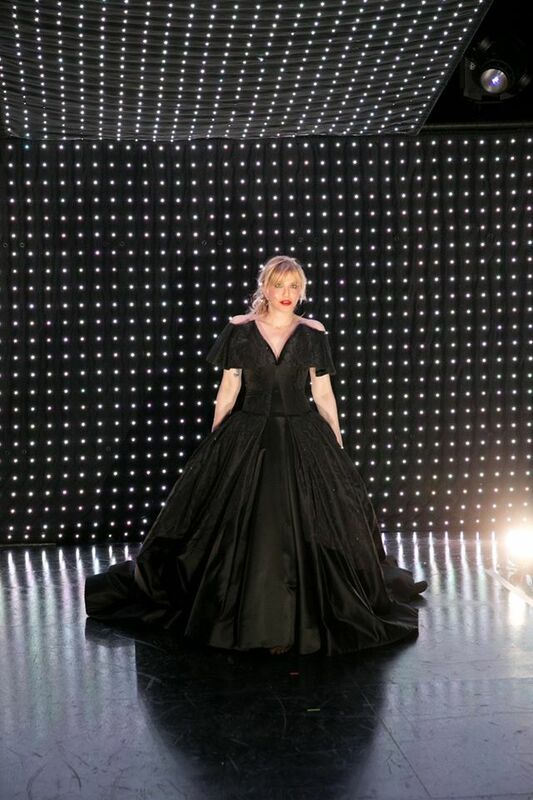 (Cambridge, MA) Courtney Love stars as Athena, the idealized, former girlfriend of the titular Kansas City Choir Boy (Todd Almond). The show begins when he sees a news story on TV that she’s been found dead in a New York City park.This touches off either a series of memories or a fantasy in which the two spend the show singing love songs to each other. Their courtship is hurried. They sit in cars. They marry. She leaves him to pursue a creative, non-specific career in the city and he finds her, wearing a “goddess” dress by Zac Posen that I will likely fantasize about until I die. It’s a show that speaks in big emotions and general character sketches. Between D.M. Wood and Victoria “Vita” Tzykun’s set and lighting, it unfolds like a stripped down music video. The chorus are referred to as “sirens,” lending their vocals to impressionistic, grunge-y music as they casually hand Love and Almond props and costumes. Every character on the stage is an outline of a person, there to lend friction, chemistry, and a point through which the electronic-edged pop songs can focus. Love has presence. Of course she does. She fills the room when she enters, something lingering after she leaves. Even without her music career and reputation, I think she would still move and sing with the same sureness. Her voice is cigarette-rough, dark and raw, with more gravitas and personality than the girl Almond’s lyrics describe. No, if anything, she inhabits her Athena namesake more than the dead ingenue. What an expected delight to see her in this setting. The music is more layered than its thin, disappointingly safe story. Not all the songs worked for me even if most did. According to the composer’s note, he got the idea when he was in a Kansas hotel room and learned that an actress he knew professionally had died. The plot of small-town-girl-meets-small-town-boy still seems to be inside that moment of inception, never quite developing into something more. It’s a romance that comes to a halt when it could take any number of turns. What we have instead is a story that is worshipful of Love but, beyond that, very interested in itself with some cool lighting choices and slick music. It’s a closed circuit of mourning for a distant goddess, a stylized gravestone with very little buried underneath. Also, dress! There’s an amazing dress. Photo: Evgenia Eliseeva; the dress. Asking Kansas City Choir Boy to be less abstract and more specific, detailed, and personal, however, may be like asking a painting of a desert to be a painting of the sea. Certainly, leaving the theater wanting more isn’t the worst reaction in the world. I’m not sure I’m a fan of this sort of musical revue, though, where the actors and audience are in such an intimate setting but the story is too distant to bother. Added by The Queen: This is yet another A.R.T. production comprised of actors from outside Boston. For a company that claims to serve its community, the A.R.T. is remiss in serving the creative community of the Boston/Cambridge area. This entry was posted in Uncategorized and tagged "Amadeus", 2015, American Repertory Theatre, art, Athena, Boston, Cambridge, Community, Courtney Love, D.M. Wood, David Bloom, Evgenia Eliseeva, grunge, Kansas, Kansas City Choir Boy, Kevin Newbury, love story, MA, New York City, October, Sam Pinkleton, sirens, Todd Almond, Victoria “Vita” Tzykun, Zac Posen by gilliandaniels. Bookmark the permalink.